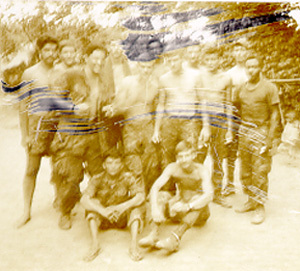 Members of CAP 2-7-2 shortly before Sept. 10, 1970, standing from left to right “J.J.” Arteaga, KIA; Dan Gallagher, KIA; Art “Chubby” Yelder, WIA; Roch Thornton; Nelson Kilmeister; “Willie” Williams; Rick Erpelding, WIA; “Country” Roach; “Frank” WIA; “Hucklebuck” Prock; D.L. “Mot” Motley, WIA. Sitting, left to right, Gia, WIA; “R.J.” Carrier.